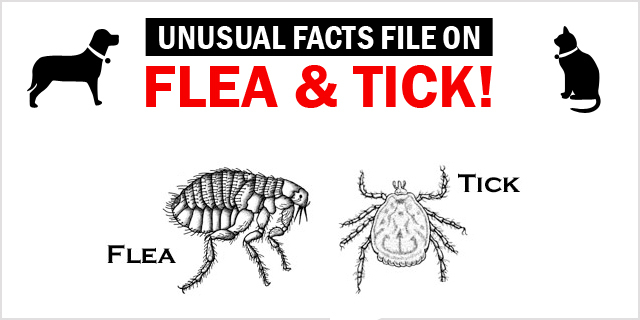 Fact Files: Unusual Facts About Flea And Tick! Flea and tick infestation is the prime concern of every person who owns a dog or a cat. We all know how these pests affect their host and we are also aware of the solutions that might save the pets from them. However, there are some facts that you might be completely unaware of. Let’s get to know some of the crazy facts on flea and tick that you may have never known before! Have you ever wondered how fleas move? Several people think that as fleas fall in the category of insects, they fly. However, they do not fly. Fleas hop. When we know that fleas hop, we may imagine them jumping in small heights. As it turns out, fleas can put the athletes to shame with their hopping abilities. They can jump 110 times their length! It is like an average human jumping over a 30 storey building. You all must be familiar with the concept of acceleration. The body catches acceleration post to its launch from the base. In case of hopping fleas, they accelerate 20 times more than a space shuttle. According to the researchers, fleas have been on the Earth for at least 165 million years now. The fossils of fleas date back to the Mesozoic era. Yes! They were there in the Jurassic period! Female fleas lay at least 20 eggs a day. If your pooch goes untreated, half the eggs will be female which continues the cycle by laying eggs. Within 60 days, your dog may have 20,000 new fleas on his body. Unlike fleas or other insects, ticks do not fly or hop. Ticks crawl up the host’s body from the tips of the grasses and attach themselves to pets. If ticks can neither fly nor hop, why are they classified as insects? Well, they are not. Ticks are arachnids and they are closely related to crawlers like spiders and scorpions than insects. This fact will surely leave you brooding about these arachnids. There are more than 850 species of ticks on this planet. Isn’t it amazing? Ticks are hard to detach from the host’s body. Have you ever wondered why? The saliva of some hard ticks act like cement which anchor them to the host’s body strongly and makes it difficult to remove them. Ticks are known to be more dangerous than fleas. The reason is simply that tick borne diseases are lethal. Lone star ticks bites can cause rare allergies to red meat in humans. Weren’t these facts completely bizarre? Looking at the abilities of a hopping flea and allergy inducing ticks, it seems that using a flea tick preventive like Frontline Plus for dogs and cats is necessary to protect them from these pests. PREVIOUS POST Previous post: Heartworms In Dogs- Facts And Figures!